We offer a trendy direction for interior and exterior design of residential and commercial spaces — a range of tiles and panels of natural Baltic amber. Create your own amber room with us! 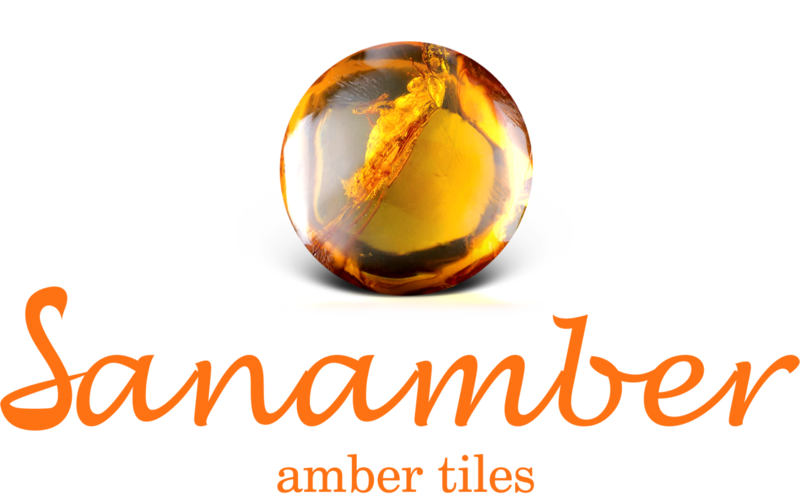 We offer a trendy direction for interior decoration and exterior residential and commercial premises - natural Baltic amber tiles and panels of "SanAmber" company in Moscow and St. Petersburg. These products are made by real professionals in the processing of natural amber, the highest quality and created to give uniqueness to any design style of the interior. Living rooms, office, study, banquet room, library, bathroom, kitchen, bar, pool or spa-salon will get their charm and rich appearance with tiles and panels made of natural amber. Amber can vary in the color range from yellow to red, from green to blue, but the classic color of amber is honey. The best samples of amber are transparent, but some types of stone are muddy. Sometimes in amber there are insects or pieces of earth, leaves, needles and the inclusion of small fossils of plants and animals. Amber is the petrified wood resin of extinct conifers and ancient pines. This is amorphous carbon, which may contain particles of various foreign materials, insects and air bubbles and stuff. Its brilliance from fat to resinous. The hardened resin must be several million years old to be called amber. Recently hardened resins are called copals. Amber got its name from the English "ambre", from the Latin "ambra" and from the Arabic "anbar ambergris". Since amber is a soft stone, it can be easily scratched. It is necessary to store amber jewelery separately from other jewelery to avoid scratches. Amber has been valued and used for centuries in jewelery and jewelery from the Stone Age. He was widely known to the Greeks and Romans, who used it extensively in jewelry. Amber is perhaps the most ancient substance used to create jewelry. Amber beads and pendants were found in the graves of northern Europe, dating back to 8000 BC. The work "Jurassic Park" glorified amber. The book and the film used the idea that amber, containing an ancient mosquito, could be the key to recreating dinosaurs. The main goal was to remove blood from the intestines of a mosquito that ate a dinosaur just before it reached into wood tar, which later hardened and became amber. Amber balances the endocrine and digestive systems, helps with colds, helps relieve nervous tension. Amber brings good luck. It is associated with time, cycles and durability of the stone. Amber is also considered a very sensual and magnetic stone. Amber emphasizes the positive features and qualities that make the wearer attractive. Amber has long been associated with healing energy and mental stimulation and is said to balance aggressive features. The most famous source of amber in the world is the Baltic coast of Germany. Amber is also found off the coast of Sicily and England and in Myanmar (Burma). There are rich deposits in the Dominican Republic, Mexico and the state of New Jersey in the Western Hemisphere. A particularly interesting amber deposit in New Jersey, which gave science more than 100 previously unknown extinct Cretaceous insect species and microorganisms, dating back 94 million years. Due to the preserving properties of amber, the DNA of the samples trapped inside remains intact, which gives scientists a unique opportunity to study the DNA of extinct species. Amber is one of the most popular stones mined today. Currently, amber is widely used in the form of plates, tiles, murals, baseboards, pilasters and other decors and accessories in the design of residential and commercial interiors. This product is made by real professionals in the processing of natural amber, of the highest quality and is created to impart uniqueness and uniqueness to any design style of the interior. The living room, office, study, banquet room, library, bathroom, kitchen, bar, pool or spa-salon will get their charm and rich look with tiles and panels from natural amber from our architecture studio and design. Also, amber is used in the production of beads, amulets and talismans, jewelry, mouthpieces, cigar and cigarette holders, pipes and other small decorative items. We work from 10.00 to 18.30, on weekdays, on Moscow time. Write, we will call back!